Household pests are more than an unsightly nuisance; they can bring harmful bacteria and disease into your home. Matrix Pest Elimination is your best Home Defense. Matrix Pest Elimination will rid your home and yard of pests and keep them away. Our year-round pest Elimination service starts with a thorough inspection of your property to find every potential hiding and breeding ground for all pests and unwanted insects. Matrix Pest Elimination’s highly-trained, licensed service technician will prescribe a customized treatment program designed to create a pest free environment in your home and yard all year long. Your Matrix professional knows what works best against a multitude of pests. Based upon your needs, we will choose from our extensive arsenal of advanced solutions, from the industry’s most effective baits, dusts, traps, and sprays, to spider-web removal and rodent exclusion work. 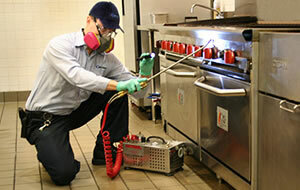 If you have a pest problem between services, we will come back and resolve it at no extra cost. MATRIX also has an extremely effective treatment for Bed bugs. To learn more, contact us today. All of our solutions are backed by the strongest guarantee policy in the industry. Contact us today to find out how we can help you keep your buildings pest free. We look forward to hearing from you.